I’ve teamed up with Mouse On Mars and after a long time of development our music drawing app called FluxPad will be released soon. I am also designing and developing two new mobile music apps for TeaTracks. I am still curating UCON - a bit outdated site -, a monthly radio program on radio tonka. Below you find a selection of some of my (more recent) work and some older video footage. The sonic light performance/installation \/\//\/\ with Mike Rijnierse was to premiered at the Rewire festival 2011 in Den Haag. For n iPhones running Gliss. Here is also a short video. 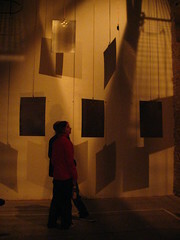 "es raschelt", a sound installation for fluttering sheets of paper as seen at stony brook university art gallery during icmc 2010. the paper performs a unique generative composition. The sonic video installation for 5daysoff, which I've built in collaboration with Mike Rijnierse is to see at NIMK Amsterdam from 3. - 7. March 2010.
horizons_5DAYSOFF from Mike Rijnierse on Vimeo. My piece "Cut" for paper, percussion and SuperCollider has been premiered by Jonny Axelsson at the ISCM World Music Days 2009 in Göteborg, Zweden (04.10.2009). 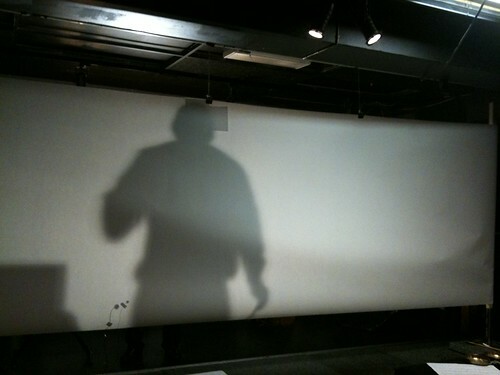 This pieces uses a 1.5 x 5 meter sheet of paper and the shadow projection of the performer. Recently it has been performed by Eric Bumstead at a BEAST concert in Birmingham. Here are some pictures of Schafskälte, an installation at Gaswerk Weimar in collaboration with Tom Tlalim and Mike Rijnierse supported by Stroom. First live performance of Hexagon (v. 2) for the Manta controller. The concert took place in Weimar with nice video work by MXZEHN. 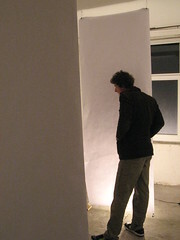 Es raschelt: An installation for long sheets of paper. A small scaled version fo this installation has been set up in Weimar. 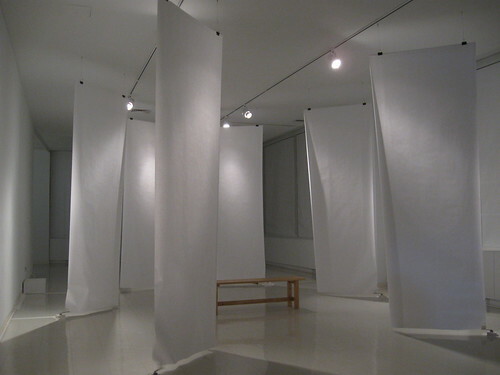 Two sheets of paper hanging from the ceiling play a generative composition. Paper are being shaken and rattled by 2 stepper motors. Hexagon study 01: A short improvisation on some new material. Using the amazing Manta interface. y, SuperCollider Symposium, London. With Mike Rijnierse. 06. February: t.i.e. at Spa2, Berlin. 16. January: "Cut" for percussion, paper and computer in Birmingham (more info soon). 19. 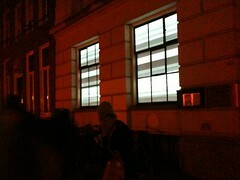 November: First appearence of my iPhone ensemble t.i.semble at Studio Loos, The Hague. Also on the program: 'Hexagon' for computer (SuperCollider) and Manta. 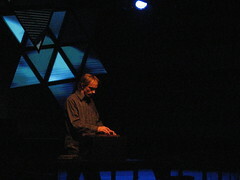 'cut' for paper, percussion and computer at the ISCM World New Music Days 2009 performed by Jonny Axelsson. 16th September: 'Hirngespinste' for saxophone, piano, percussion and 3 wii remotes controlling SuperCollider live in Vilnius payed by the LOOS Ensemble.